This is a fascinating story. One that I hope I tell well. Here goes. A while back we received an email through our website from a company called The Linc Group (an international facilities management company). They were interested in commissioning me to paint a 16th century Spanish Galleon ship (which is their company logo). 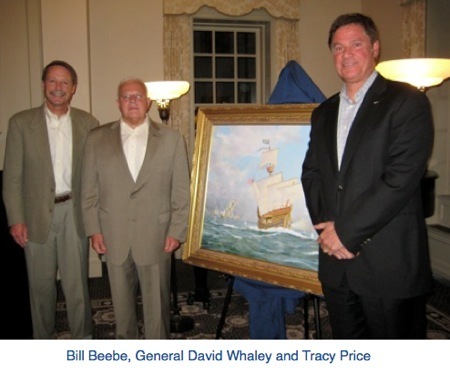 The painting would be a retirement gift for retiring Executive VP and COO, Major General David Whaley, U.S. Army, Ret. My first thought was what a nice honor that would be. Little did I know! My first phone call to discuss the commission was with Lieutenant General Ross Thompson, U.S. Army, Ret. and Senior VP, Operations for The Linc Group. He said he would like to arrange a three-way conference call with the President and CEO of The Linc Group, Mr. Tracy Price, to discuss the painting. Next thing I knew I was listening to Ross Thompson and Tracy Price tell me the amazing company story. They explained the symbolism they would like me to include in the painting and informed me as to how meaningful this painting will be to its recipient, the soon to be retired Dave Whaley. My enthusiasm for the project was growing quickly! It all turned out to be quite fortuitous, as the retirement dinner had already been planned and was to take place in Williamsburg, where we live! Ross Thompson kindly asked us to attend and present the painting at the farewell event! The fascinating company history begins with Mr. Price selling his software company to Enron in 2001 and going to work for the perceived powerhouse Enron. Shockingly, nine short weeks later, Enron imploded. He was bound and determined to save his old company and sever the Enron ties. He led a management team buyout to take back his company. After two grueling years of endless battles and red tape he accomplished his goal, renaming his new company The Linc Group. It was to be the sole surviving company from the Enron wars. Tracy Price and Dave Whaley together had a strong vision for this new company and it is reflected in the company ideals, corporate culture and logo, all a direct result from the Enron debacle. In our conference call, Tracy Price described his vision of the painting to me. In the far distance, there should be a battle scene with the crooked "E" Enron logo somehow incorporated into the scene, maybe some flames, ships burning…. 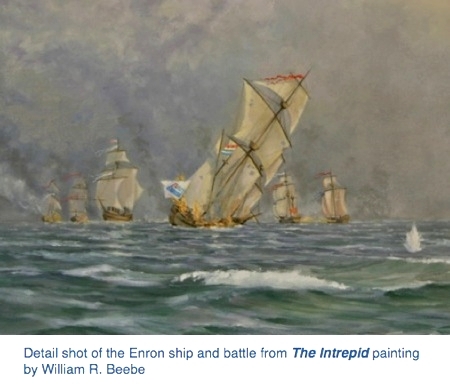 The ship Intrepid (the company logo ship) should be firing its cannons with its flags flying high and the Intrepid should be the main focus of the painting. 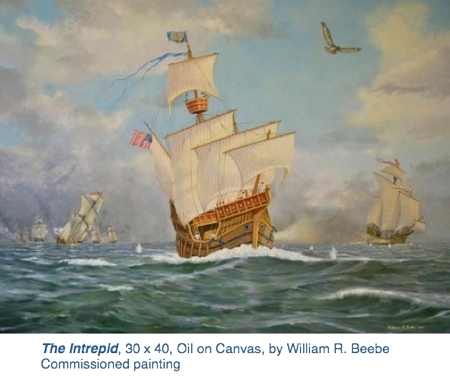 After spending some time researching 16th century Spanish Galleons at the Mariners’ Museum in Newport News and at the Williamsburg Library, I began work on this exciting and challenging painting. 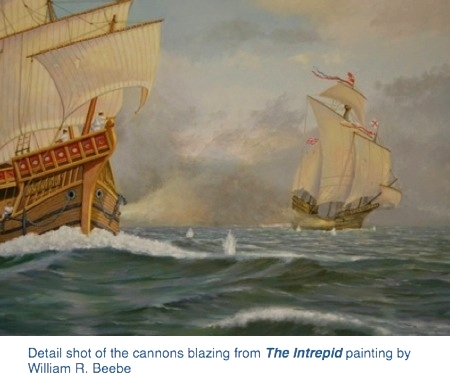 Creating a distant battle scene, painting the good ship Intrepid under full sail on the open sea and telling the company story with all of its symbolism made the painting process all that much more gratifying. Most of all, the honor of having this painting going to Dave Whaley as his retirement gift made every painting day fulfilling. My wife and I attended the retirement dinner for the unveiling of the painting here at the beautiful Williamsburg Inn. While my painting rested on the easel under a blue cloth in the front of the room, we had the distinct pleasure of listening to the management team one by one pay tribute to their mentor, boss and friend Dave Whaley. By the end of the evening we felt like we knew Dave personally. The love in the room was palpable. Everyone delivered heartfelt, emotional tributes. It was unmistakably obvious to us that this is a great man! Tracy Price unveiled my painting, his vision now on canvas, and shared some thoughts of how this project came about. Ross Thompson then eloquently read my summary of The Intrepid painting, after which I was introduced as the artist. My wife and I were greatly honored to be there on such an auspicious occasion. We shook hands with Dave Whaley and I told him what an honor it was to paint this painting for him and to get to meet him personally. As we drove home from the Williamsburg Inn, we debriefed, both of us struck by the emotions of the evening, the love and admiration for this man and how fortunate I was to be the one chosen to paint The Intrepid for him. I am grateful that this rewarding commission came along and that we had the opportunity to cross paths with some truly wonderful people through my work. Just another reminder of the power of art! My summary of this painting that was read at the retirement dinner and the explanation of all of the company symbolism is posted in the follow up to this blog. I hope you all enjoyed reading about this painting as much as I enjoyed telling the story! When envisioning and creating this painting my goal was to tell a story of hard fought battles and ultimate triumph. I endeavored to convey this through a dark, smoky battle scene on the horizon line offset by the victorious Intrepid emerging through brighter, clearer skies as a strong, fearless leader and an unmatched competitor. The Spanish Galleon Intrepid, which is the central focus of this painting, is cutting through a wave, riding high and fast to symbolize success, strength, perseverance, and leadership. I painted the crow’s nest and the upper deck railings with red panels, common on 16th century galleons. Red, being a bold color, is frequently associated with winning and strength. The RAF flag is flying high atop the main mast reflecting the company ideals of respected, admired, and feared. The gold leaf laurel branch under the ship’s name symbolizes a triumphant ship. The blues in the RAF and banner flags are The Linc Group logo colors. The Intrepid is firing off her portside at her present day competition (flying British flags to represent global competitors). The British ship is veering off course intimidated by the bigger, stronger competition. Off the stern of the Intrepid is the sinking of the ship Enron. She is listing to her starboard side, water gushing over her rails, fire burning up her deck with no hope remaining. Smaller ships around the Enron are burning and shooting at each other, symbolizing all who went down with her. The one galleon surviving the firefight (TLG) is heading out of the smoke of the “Enron wars” to fight another day! The mighty hawk, with its wide wingspan, is guiding the ship to the blue skies that lay ahead and toward enduring success. I painted a choppy, big sea but not so turbulent as to put the Intrepid in danger. Dark shadows indicate the deep water final resting place for those that went down with the ship Enron. The good ship Intrepid cuts through the sea with power and pride forging ahead with a stiff wind in her sails and a strong vision for the future!